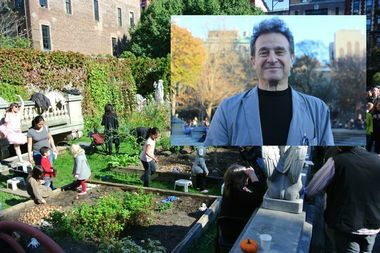 CB 2 chair Tobi Bergman said that the board won't cooperate on future affordable housing projects if the city won't negotiate with them on a plan to build housing on a beloved community garden. NOLITA — The chair of Community Board 2 warned the city's Department of Housing Preservation and Development Thursday night: Push ahead with the plan to build on Elizabeth Street Garden and the city will get no support for upcoming affordable housing projects in the Greenwich Village-SoHo area. The board has resisted the agency's plan to build 60 to 75 units of affordable housing for seniors at the 21 Spring St. garden site since residents started organizing around the garden in 2013 and learned of the housing plan HPD made the year prior. While HPD officials have met with the board in the past — as recently as May, when board leadership had a private meeting with HPD and Councilwoman Margaret Chin, who is advocating for the project — the agency is apparently now refusing to engage with CB 2. "You can't expect to run people over in one location and expect them to lie down in the tracks for you at another location," CB 2 chair Tobi Bergman said in a speech at Thursday's full board meeting. "That seems to be an expectation, because there are other big projects coming up." While Bergman's words sounded like a threat, he insisted they were not — "because it's not willful." The consequences he described, he said, are a product of human nature, and how people will react to the city taking away the garden they love. "It's not like we can turn around one day and say, "OK, yeah, you did stuff over there, but we're still all friends and we're still going to do everything we can for you,'" Bergman said. "The world doesn't work that way. People are not motivated that way." Major development is expected at the St. John's Terminal building across from Pier 40. The owners of the building have been in negotiations with the city and the Hudson River Park Trust for years now, working out a deal to buy air rights from the pier. Meeting notes obtained by DNAinfo a little less than a year ago outlined a plan to buy 250,000 square feet of air rights for $100 million, with at least 110,000 square feet of the St John's development — 150 to 200 apartments — set aside for affordable housing for seniors. Bergman noted that the prospective St. John's development "will benefit Pier 40 and Hudson River Park," as the air rights money would fund badly-needed repairs to the pier. It is also expected to include "very substantial amounts of affordable housing," he pointed out. "Frankly, it is going to be a proposal for a big building," Bergman said. "There are going to be people who do not want a building that big. And the effort in this community to both benefit Hudson River Park and benefit the need for affordable housing is going to be very much harmed if we are still fighting or have taken a beating at Elizabeth Street Garden." Bergman and the garden's supporters are also frustrated by HPD's refusal to discuss alternative sites for the 21 Spring St. development. Locals have been adamant that they want affordable housing as much as they want the garden — they just want both. One board member accused the city of putting the neighborhood residents in "a 'Sophie's Choice' situation." "It’s very problematic when there’s a citywide initiative that’s as important to this mayor, to the city, to the community, and we can’t get any traction," Bergman said. The HPD project at 21 Spring St. dates back to 2012, before the lot was known as Elizabeth Street Garden, when it was a lovely-looking, but largely inaccessible, sculpture storage area for the gallery next door.